In general, desserts do very well on our blog. They often have an above-average number of pageviews from our readers, but even more often than that, they score above average in our 0-10 points rating system. In fact, the last two additions to the Pantheon have been desserts. The Dark Chocolate Sea Salt Bar and Lemon Ginger Ice Cream, both reviewed by Russ and Sandy, were the latest sweet treats well-deserving of our elite-eats label. Out of the past five Pantheon foods, three have been desserts. And Sonia and I enjoyed the Raspberry Macaroon Cake enough to give it a 9 out of 10. I think all four WG@TJs reviewers have a sweet tooth to some degree or another. I know I certainly do. So when I did our TJ's shopping this past week, I managed to make half of my purchases dessert foods, much to the chagrin of my wife, who is slightly more health-conscious than I am. But anyway, these lemon bars, like the Macaron aux Framboises, come frozen, and they require a thawing time of approximately 45 minutes. They're fairly small, but they're heavy and rich. When I popped the first one into my mouth, I wanted to shout "Lemony Snicket!" I'm aware that's the name of an author of children's books and not something to shout after eating a citrusy dessert, but it certainly seemed appropriate at the time. I then proceeded to refer to the desserts themselves as "Lemony Snickets." "Sonia, would you like another Lemony Snicket?" and so on. And indeed, they are quite lemony. They're highly sweet and extremely tart. Their texture varies greatly upon the amount of time they've been allowed to thaw. Right at 45 minutes seems to be the ideal time for consumption. Before that, they're too cold and icy. Wait too long after that, and they get very mushy, to the point you can't eat them without getting messy or using a spoon, especially if it's hot out. There was a curious sheet of white confection on the top of each piece. It was like a very thin layer of powdered sugar or something. It dissolved on the tongue instantly, and it was very sweet. Occasionally, the sheet would frustrate me by sliding off the lemon bar and landing on the floor or my lap, at which point it became nearly impossible to salvage intact. I felt the bars had a nice balance of tart lemoniness and sugary sweetness. Sonia agreed. She pointed out that the bottom cake-ish layer could have been a bit firmer. It tasted great, but it was quite flimsy, especially once it had been thawing beyond an hour or so. The custard section was very creamy and good. Just what I was hoping it would be. We're going to give these lemon bars double 4's. I'd say they're a must-try for lemon-lovers. This sounds awesome! I make these from scratch usually but an 8 out of 10? I might pick some of these up! Thanks for the review! Mmmm I love these. Always wanna pick them up whenever I go! 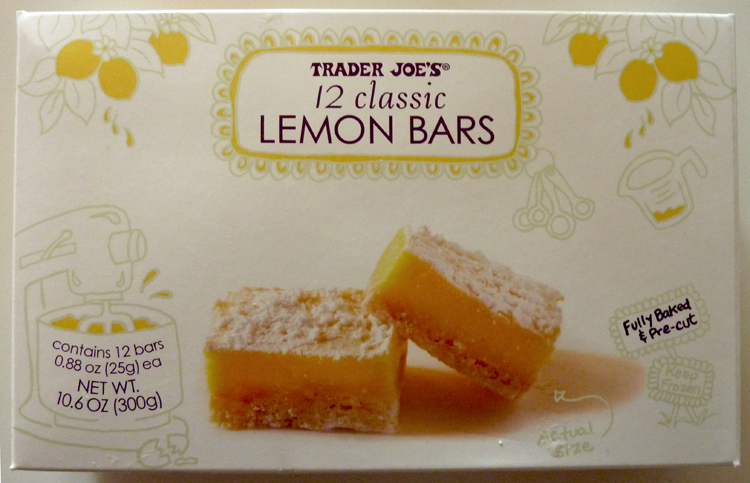 I am a lemon bar fanatic and had to try these. They're more like lemon cubes, not bars, and I was let down when I let them thaw. No matter how long I thawed each cube, they still had a frozen taste to them. I began to like them, though, after I followed the microwaving directions. This caused them to completely melt into a pool of warm lemony goodness. Yes, they were more a lemon puddle rather than a lemon bar, but I felt they tasted best that way. Try them frozen! I like them even better that way and there's no wait. I just ate four of these. They are AMAZING!! Pretty tasty. 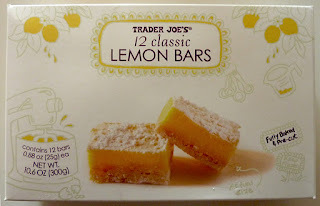 Only complaints are that the lemon bars pictured on the box are 50% bigger than the ones inside the box (so just be aware of that when you buy), and my bar melted into a pool of goo after only 13 seconds in the microwave. These are delicious! I just tried them today and wanted to read reviews of them (after consuming them all rather quickly), so I stumbled upon this site. I think they were awesome, I actually ate the whole box in one sitting. Although, that isn't really saying MUCH because my only complaint is that they are soooo small :( I also agree that the bottom crust could have been firmer, and I also think a litttttle more of the bottom crust would make them absolutely perfect. Either way I enjoyed them very much. I pretty much inhaled them. I LOVE THE MANGO BARS...haven't seen them in a year. Do they still make them? ?